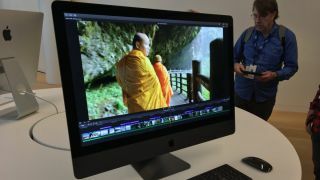 At the Final Cut Pro X Creative Summit which took place over the weekend in Cupertino, Apple again showed off the incoming iMac Pro, allowing folks to take some fresh snaps of the space gray all-in-one (with matching accessories) ahead of its launch in December. The iMac Pro has the same chassis as the standard (consumer-targeted) iMac, but Apple has differentiated this much more powerful model by giving it a space gray color scheme. 9 to 5 Mac captured a number of snaps of the new iMac, which isn’t quite the same space gray that you’ll find on the MacBook Pro. In fact, it’s a little bit darker than that shade, which we rather appreciate. Naturally, the partner peripherals – the Magic Mouse, Keyboard and Trackpad – are the same matching darker space gray. These will only be available with the iMac Pro (at least to begin with, anyway). The new all-in-one won’t come cheap, and would-be buyers will have to prepare their wallets for quite a beating when it comes to the price tag: the souped-up all-in-one starts at $4,999 (around £4,949, about AU$6,520). Even the entry-level model has a good amount of power under the bonnet, as you might expect, running with an 8-core Intel Xeon processor, AMD Radeon Vega graphics, 32GB of ECC system memory and a 1TB SSD. You also get a 27-inch Retina 5K display. For further details on available specifications and models, check out our full roundup of all the latest iMac Pro news and features.